The free world has lost its leader. 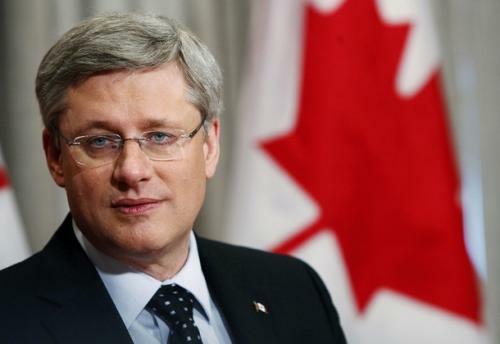 In the absence of a vigorous American foreign policy, Canada's Stephen Harper supplied his own. For the better part of a decade, he energetically championed Western interests. He was serious about fighting terrorism, keen on free trade and prepared to deploy proportionate force in defense of freedom. His defeat in last week's Canadian general election will be felt far beyond that sparse, chilly country. When other Western leaders fretted about Israel's 2006 Lebanon war, he gave his full backing to the Jewish state. When others dithered over Putin's invasion of Ukraine, he led international condemnation. Obliged to meet Vladimir Putin at a summit meeting, he was admirably curt: "I guess I'll shake your hand, but I have only one thing to say to you: Get out of Ukraine." Canada, like most countries, partly defines itself with reference to what it isn't; but Harper was uncomplicatedly pro-American and pro-British. In his first overseas speech as prime minister, he told a London audience how glad he was that his was a common-law, Anglosphere nation. As a matter of historical fact, this might not seem especially radical; but, my goodness, what a refreshing break from the line taken by previous Canadian leaders, namely that their country was a happy multiculti fusion of First Peoples and Acadians and Vietnamese boat people. Why did Harper lose so badly? The Canadian Right got its second-lowest share of the vote since 1968, and can't console itself with the thought that it was beaten by opponents whom it had dragged onto its own ground. Bill Clinton and Tony Blair had to meet their Right-wing rivals half way on many policy issues. But Justin Trudeau, the new Canadian PM, is like a depilated Occupy protester: pro-tax, anti-business, pro-pot, anti-America. From an outsider's perspective, it seems mystifying. Canada was the best-performing major economy in the world, the only G7 state to come through the downturn without a downturn. It's true that the recent drop in commodity prices caused a slowdown, but the big picture remained positive. Taxes were falling more rapidly than at any time in the nation's history. Crime rates were at a record low. Illegal immigration had been curtailed, with the result that legal immigrants were grateful, patriotic and - unusually - happy to vote for the Right. It won't do to argue that Canada is a naturally liberal country. Conrad Black used to speak of his countrymen as "English-speaking Scandinavians." In fact, both Scandinavia and Canada went through a teenage socialist phase from the late 1960s to the late 1990s, and then snapped out of it. Until Pierre Trudeau, the new PM's father, Canadian immigration policy was based on keeping combined provincial and federal taxes below the U.S. equivalent, so as to compensate for the rougher climate. Before the goody-two-shoes, pantywaist, demilitarized Canada of the 1970s, Canadians were a famously tough people. Eisenhower used to remark (in private, obviously) that, man for man, they were the finest soldiers under his command. Harper believed, with justice, that he was returning his countrymen to their traditions. What, then, was the problem? Put simply, Canadians had tired of their leader. Leftists, naturally, called him a hater, a Tea Partier, an Islamophobe, yada yada. But, more significantly, Tory pundits would remark on his "coldness" and "remoteness." A typical column in the right-of-center National Post - the newspaper founded by Conrad Black - blamed the defeat on "the nastiness of Tory politics under Harper, the mindless partisanship, the throttling of backbench MPs." I'm not sure this is fair. In my scant dealings with Stephen Harper, I found him courteous but shy - a common Canadian combination. But it was widely believed. Not for the first time, a great leader, with immense achievements, stayed on for one election too many. It happened to Australia's John Howard, even to Britain's Margaret Thatcher. Prolonged executive power is more than most politicians can take. Even the best and wisest leaders - and they don't come better or wiser than the two I've just mentioned - eventually lose touch. The pressures of modern government, the sleeplessness, the security cordons, the constant international summits make it hard to remain grounded. Perhaps George Washington's single greatest act, in a lifetime of great acts, was to impose a term limit on himself, and thus to set the standard for all his successors (except the narcissistic FDR). Term limits are the surest way to stop your leaders from becoming power-crazed. Sadly, term limits are no defense against the emergence of political dynasties - a nasty habit that has now spread from the United States to its northern neighbor. That, though, is another story. Daniel Hannan is a British writer and journalist, and has been Conservative MEP for South East England since 1999. He speaks French and Spanish and loves Europe, but believes that the EU is making its constituent nations poorer, less democratic and less free. He is the winner of the Bastiat Award for online journalism.